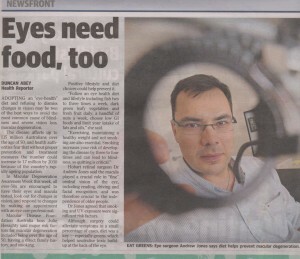 Over Macular Degeneration awareness week The Mercury highlighted both the importance of diet and the need for regular eye checks. In a survey commissioned by the Macular Disease Foundation 47% of Australians ranked loss of sight as their number one health concern. But one in four Australians >50 yrs old still haven’t had their eyes tested or macula checked in the last 2 yrs.